On this date in 1942 Maj. Gen. Dwight D. Eisen­hower arrived in London, Eng­land, to assume adminis­tra­tive and opera­tional com­mand of the Euro­pean Theater of Opera­tions, United States Army. Set up 16 days earlier, ETOUSA directed U.S. ground, air, and ser­vice opera­tions north of Italy and the Medi­ter­ranean coast. When war broke out seven months ear­lier Eisen­hower was working in Washing­ton, D.C., in the Army’s War Plans Divi­sion. In March 1942 the briga­dier gen­er­al was pro­moted to major gen­er­al and appointed to head the War Depart­ment’s Opera­tions Divi­sion, holding the title Assis­tant Chief of Staff to Gen. George C. Marshall, with respon­si­bil­ity for creating the major war plans to defeat Japan and Germany. A month after arriving in Eng­land in 1942, the 51-year-old Eisen­hower was chosen to lead the assault on Vichy French Africa, despite never having had hands-on com­mand of a single com­bat unit. During their Christ­mas meeting the pre­vious year in Washing­ton, D.C., Presi­dent Franklin D. Roose­velt and British Prime Minis­ter Winston Chur­chill were keen to grab Adolf Hitler’s atten­tion in order to keep Soviet leader Joseph Stalin from pur­suing a sep­a­rate peace with Nazi Ger­many. A sep­a­rate peace could divert millions of the enemy to Western and Southern Europe. Eisen­hower’s bril­liance at com­manding a desk in Washing­ton even­tually paid huge divi­dends when he trans­lated mili­tary stra­tegy into prac­ti­cal action (Oper­a­tion Torch) that began on Novem­ber 8, 1942, the suc­cess­ful six-month Anglo-Ameri­can struggle to oust German and Italian forces from North Africa. After Torch, Eisen­hower (now a four-star general) over­saw the in­va­sion of Sicily (Opera­tion Husky) and the Ital­ian main­land. In Decem­ber 1943, Eisen­hower was tapped for the role of Supreme Allied Com­man­der in Europe. In January 1944, after a ten-month absence, he returned to head ETOUSA and in Febru­ary was elevated to Supreme Allied Com­mander of the Allied Expe­di­tion­ary Force (SHAEF). In these posi­tions the once Chief of the War Plans Divi­sion in Washing­ton was tasked with plan­ning and execu­ting the liber­a­tion of all of West­ern Europe and the dooms­day inva­sion of Hitler’s Ger­many in the West. Until the war’s end in Europe on May 8, 1945, Eisen­hower juggled opera­tional command of all Allied forces as well as adminis­trative command of U.S. forces north of the Alps. 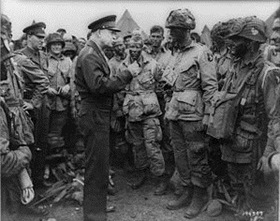 Left: This iconic photo, taken on the evening of June 5, 1944, the day before the Nor­mandy landings, captures Gen. Eisen­hower speaking with U.S. para­troopers of Com­pany E, 502nd Para­chute Infan­try Regi­ment, 101st Air­borne Division at Green­ham Com­mon Air­field in Eng­land. He was there to give the Order of the Day: “Full victory—nothing else.” In Lt. Wallace C. Strobel’s memoir (seen wearing the num­ber 23 around his neck), Eisen­hower was also talking about fly fishing with the men, some­thing he liked to do before a stressful operation. 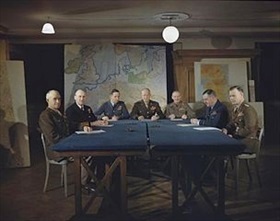 Right: SHAEF leadership at their London head­quarters in early 1944. Left to right: Lt. Gen. Omar Brad­ley, Com­man­der in Chief, 1st U.S. Army Group; Adm. Sir Bertram H. Ram­say, Allied Naval Com­man­der in Chief, Expedi­tionary Force; Air Chief Marshal Sir Arthur W. Tedder, Deputy Supreme Com­man­der, Expedi­tionary Force; Gen. Dwight D. Eisen­hower, Supreme Com­man­der Allied Expedi­tionary Force; Gen. Bernard Law Mont­gomery, Com­man­der in Chief 21st Army Group; Air Chief Marshal Sir Trafford Leigh-Mallory, Allied Air Com­man­der, Expedi­tionary Force; and Lt. Gen. Walter Bedell Smith, Chief of Staff to Eisen­hower. By the end of 1944, Eisen­hower, through SHAEF, com­manded three power­ful army groups. In the north the British 21st Army Group com­manded by Mont­gomery; in the middle the U.S. 12th Army Group, largest and most power­ful U.S. Army forma­tion ever to take to the field, com­manded by Brad­ley; and in the south the U.S. 6th Army Group commanded by Lt. Gen. Jacob L. Devers. 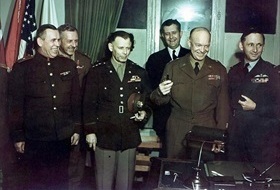 Left: Senior Allied leaders celebrate at SHAEF HQ, Reims, France, early on the morning of May 7, 1945, shortly after Eisen­hower had addressed the Ger­man mis­sion, which had been sent by Ger­man Presi­dent Adm. Karl Doenitz (Hitler’s suc­cessor) to sign the uncon­di­tional sur­render docu­ment. Pre­sent are (left to right) Gen. Ivan Susloparov (Soviet Union), Lt. Gen. Frederick E. Morgan (British Army), Lt. Gen. Walter Bedell Smith (U.S. Army), Harry C. Butcher (U.S. Navy), General of the Army Dwight D. Eisen­hower (holding foun­tain pens that were used during the signing cere­mony), and Air Marshal Arthur W. Tedder (Royal Air Force). 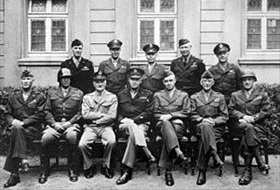 Right: Key American generals in Europe, 1945. Eisen­hower is seated in the middle. To his right are William H. Simp­son, George S. Patton, and Carl A. Spaatz. To his left are Omar Brad­ley, Court­ney H. Hodges, and Leonard T. Gerow. Standing are (from left to right) Ralph F. Stearley, Hoyt Vandenberg, Walter Bedell Smith, Otto P. Weyland, and Richard E. Nugent.